Ask The Ageless Lifter: Should I Give Up Benching? With the amount of gym rats who say they "can't bench anymore," you'd think there's a reverse age limit on the movement! No, you don't have to give it up at 35, but you'd better get serious about doing it right. Here's how. Q: I've noticed a lot of experienced older guys can't (or won't) bench press any longer due to shoulder issues, or even just fears of shoulder issues. 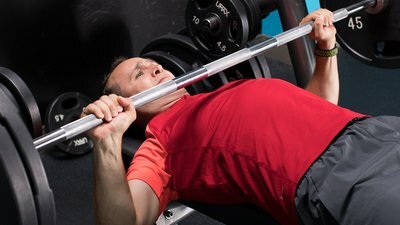 Is the bench simply an inherently bad exercise for older lifters? There's so much to say about this topic! First, the reverence that most guys have for the flat barbell bench press is completely undeserved. It's definitely not a mandatory exercise. Far from it! Don't get me wrong; it's a great exercise (if done properly), but it doesn't have any magical superpowers. No exercise is essential, this one included, and there are many chest-training drills that are just as good as the bench press, and depending on your situation, they may be far better. As I said in my article "5 Key Strategies for Mature Lifters," step one of lifting from mid-life and beyond is to learn to reconcile needs with wants. All that being said, I really don't think the bench press is inherently dangerous to the shoulders. It's just that this exercise is all too often overdone and poorly executed. If the bench press—or any exercise—hurts, stop immediately and go to "plan B." And while I'm on the subject, if you ever suspect that benching will cause shoulder discomfort, have a plan B ready to go before you even hit the gym. What I mean by this is have an alternative exercise ready to go—incline dumbbell presses, for example. My friend John Rusin, Ph.D., a strength coach and fellow Bodybuilding.com author, has pioneered a fantastic band-resisted shoulder warm-up that I implement religiously before any and all pressing sessions. At age 58, I'm pressing hard twice a week with no issues whatsoever. In fact, I recently hit a set of 10 with 100's on the flat dumbbell press, at a bodyweight of 194! It takes about 3 minutes to do, and if it sounds familiar, that could be because I also talked about it in my article "Bench Presses Don't Have to Cause Shoulder Pain." Sloppy, bounce-and-go-style benching is likely the cause of most bench-related shoulder wrecks, in my opinion. Guys, let's get rid of the slop, shall we? Lower the bar under complete control, pause for one second at the chest, then accelerate the bar back to arm's length. Yes, your numbers will take a bit of a hit initially, but your shoulders will feel much better and you'll be back to hitting new PR's before you know it. My friend Lee Boyce, a fitness author and strength coach, talked about this style of training in his article "Stop Maxing Out! Lift This Way Instead," and while it can be a hard pill for strength-seekers to swallow initially, they'll love how it pays off. Narrower grips, where the elbows are more tucked toward the body than a wide grip, tend to place the shoulders in a safer position. They also target the triceps very effectively, as you might know. But, recent research comparing close versus wide grip concluded that the difference in chest activation is actually pretty minimal between the two. No, you don't have to go close all the time. Personally, I usually bench wide once a week, and narrower on a second day. But here's the thing: If I develop any shoulder pain, I ditch the wider grip until it subsides. A technique note: There's no need to go super narrow. Just place your pinkies where your index fingers normally hit the bar, or in other words, one hand-width narrower. If you implement the previous suggestions and still struggle with shoulder pain, try benching last thing in the workout. Yes, by that point you'll have less energy, but that's actually part of the plan. You'll be forced to lighten up the load, and will be less at risk to overdo it and hurt yourself. But more importantly, the movements you do prior to benching will serve as a general warm-up, and many of my clients have had great success implementing this very simple strategy. If all else fails, keep lifting! One thing I didn't include here was to focus on getting better at benching, not just stronger at it. In other words, work on that arch, tuck in those scaps, and learn to stay tight. These are all essential for safe benching, but they're also just essential bench cues. If you're not already following them, then it's a matter of when you'll hurt yourself, not if. And if you try all of the above with little or no success, my only suggestion is to not give up on pressing entirely. Use any of the large number of very effective chest exercises available to you, including flat and incline dumbbell presses, flyes, push-ups, dips, decline presses, and various types of machine presses. Then, freely swap them out into any program that calls for benches. That's one of the great things about my program Total-Body Strong in Bodybuilding.com All Access: It can work with any movement, not just one. In that context, the bench press and all other moves are just a means to an end: getting stronger, leaner, and healthier. Saeterbakken, A. H., Mo, D. A., Scott, S., & Andersen, V. (2017). The effects of bench press variations in competitive athletes on muscle activity and performance. Journal of Human Kinetics, 57(1), 61-71.